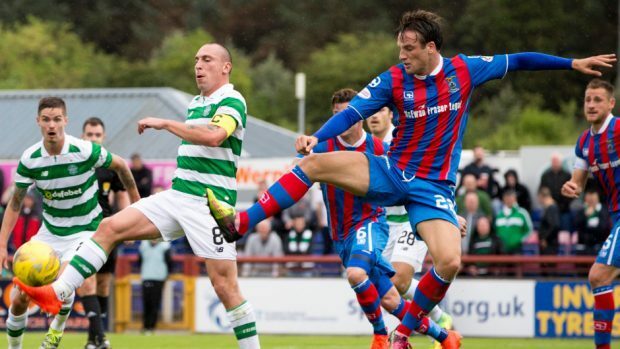 Caley Jags defender Brad McKay has stoked the flames of a twitter row following Ross County’s controversial draw against Celtic. The former Hearts defender took to social media to write “What goes around comes around” following an 88th minute penalty claim by Alex Schalk. The incident, which drew the game level at 2-2, drew the ire of Celtic fans with Hoops boss Brendan Rodgers even going as far as to slam the decision as “blatant cheating”. McKay himself was penalised for allegedly bringing down then Celtic striker John Guidetti at Tynecastle in December 2014. His tweet prompted an angry response from Celtic fans as the Parkhead club dropped point for only the fourth time this season. Celtic will face Old Firm rivals Rangers in the Scottish Cup semi final on Sunday.